One thing that Robin Bischoff knows is that everyone should own safety, not just the safety leader. Robin is Safety and Risk Program Manager at TriVersity Construction, one of the largest construction firms in the Cincinnati, Ohio region. 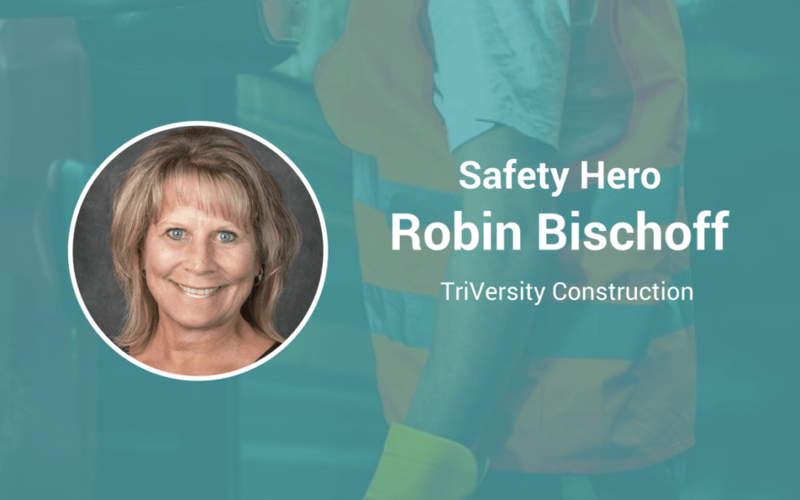 TriVersity Construction believes that people are their biggest asset and safety is the company’s number one priority—which is reflected in Robin’s approach in supporting safety, too. Keep reading to see why this Safety Hero chose safety as her profession, and what she says are the three things that are critical to be effective today as a safety leader. Actually when I worked for a former employer, the President of the company took me under his wing and mentored me. Because of my interest and focus on safety, he suggested that I think about a career in safety and a lightbulb went off. I started a safety advocate program while at Fernald, and have been passionate about it ever since. Trust, honesty and integrity. You have to be able to communicate effectively so that people trust you. People can’t feel like I’m out to get them. I have to be there to assist, not be an enforcer. Have you ever had an incident that changed how you approach your role? I never had an incident on my watch, but we did have an electrical incident at a company when I was there. [It was with a] person that didn’t follow the lock-out/tag-out process. I was on the stand-down team that did the investigation and evaluation. We, as a company failed him and his family; We had controls in place, but we still failed him. This allowed us to make changes and improve. That it must be a core value. A lot of people say it’s a priority. Priorities change; Values are constant. That everyone owns it. Not just the safety leader. Safety leaders can’t be everywhere, all the time. To go home at night, everyone has a role.